I needed a Washing Machine and was in the market for one, I how ever at the time could not afford anything much. I was looking for one that would work, and clean, that was all I asked. A friend of mine informed me there was one a woman was offering for free. So my friend picked it up for me, she and her husband brought it over and it was a off white very old machine the Signature 2000 by Norge. I was very happy to at least have something really, I was a bit worried at first being its been dinged around, and showed it, truly showed its age. I went on and tried it. WOW to my surprise, this machine was right on the money. Quick to work on any settings, there is Hot/Warm, Hot/Cold, Warm/Cold and cold/cold. I tried them all, and no weird noises. I figured I got lucky with a machine was all. I had been waiting for the machine to go out or have something go wrong with it, this was my first machine I had owned personally, I have used others however, but this was mine. I got this Machine in 2002. Things came up and we moved a few times and the poor thing has been banged up more, and still continued to hold on strong, and has never once had a concern. I was very impressed to have gotten lucky enough to have a washing machine work so well, that was free! Now we had moved to another state, and things happened where we had our things in storage. The washer was in there over a year. My mother has a Kenmore, and My husband, at the time worked in auto repair, he had a lot of grease and such on his clothes, I tried to get them out, using various chemicals and my mothers washing machine was what I was using at the time. Her machine is a good machine much newer and up to date. Needless to say it didn't make much a difference at all. We had finally gotten our house and moved it in, and still not a single problem, started right up, ran fantastic! This is the best ever, I have had to re-wash everything being in storage the clothes needed it, the machine handled over 10 hours of back to back washing clothes. I found the pants that were used at my husbands work. I placed them in and along with some gain with oxi, got them babies nearly clean! Sure some stains of where the grease marks were, but mostly all gone and hard to tell. I could not believe this old machine was better then my mothers newer Kenmore! This machine had always pulled through for many years, and has had a lot of abuse and put to work. To this day, I STILL have my machine and it works great and I will not get rid of it, unless the unthinkable happens, Keep happy thoughts! Mine just died and we are sorry to see it go. This machine was a champ. The dryer was too; it died about a year ago. The washer had just a couple of minor repairs in the last years. Even our repair guy was bummed that he could not fix it. I bought it used in 1996, and it was already old enough that the bottom of the tub had lost some coating and it appeared rusty. Never got worse, never rusted out, or affected clothes. Truly a masterpiece of washer/dryer machinery. We will look for another older washer because they last so long. My sister just bought a brand new set that has Wi-Fi so she can run it from her phone. My friends have bought new and had to replace them after 5 years. I'll just stay with the good old fashioned reliables. But am going to miss our Norge. I don't know where you live, but the Chesterville Antique Mall in Chesterville, Il has all kinds of great washers and dryers. May have what you are looking for. Everything is cleaned and checked out so you will get a great deal. We go there all the time for all our home needs. I stored it for a year after. Brought it in ;plugged it in; it has been a great replacement. I bought this machine at Wards in 1990 as a floor sample scratch and dent. It has been the best machine always getting out the toughest stains without ever needing service not even a belt but this week the transmission went out and sadly i had to put my old dear friend out to the curb. but i will never forget its quality and service. In 1997 i had a old Kenmore washer with 4 wash cycle Heavy duty and a old 1971 Maytag halo of heat dryer. one day in the dead of winter i had decided that i have had enough!!! The washer recently started spitting grease into the clothes, and the dryer made a terrible squeaking and you had to set an egg timer on when to know what time to check on the dry (The timer in the dryer no longer worked) anyways the last day i ever did a load in the washer was when i washed the comforter, i turned the washer dial to 14 on cotton sturdy wash, turned the water level control to high and went upstairs for a while, 30 minutes later i went downstairs to check on the wash, and there was water everywhere, i opened the lid and it was still filling and by that time it had overflowed everywhere and ruined the carpet, so i told my husband that we were going down to kelsons furniture and appliances to buy a new washer and dryer, we got there and i picked out a crosley heavy duty 20 pound capacity washer and a crosley gas dryer, brought it home plugged them in and they both worked great until october 4 2009 when the gas dryer had got clogged with lint over the years until finally it set ablaze, thankfully i live close to a fire department and they got there just in time and put it out and the strangest thing the washer was all burnt on the side and a bit underneath but i tried it to see if it still worked and it worked fine!!! i still have it to this day and although its all burnt and pretty much completely rusted out, im keeping it like you say, until the unthinkable happens, oh and i forgot my washer looks exactly the same as this one so i just thought id say! Wow! Better than the Energizer Bunny! I got my singature 2000 waher from Montgomery Wards in 1992, it was the floor model. last year the lid hinges finally rusted through and let the lid fall onto the drum, so we took the lid off. Where the water dispenses was supported by the lid, so I took a metal coat hanger and made a loop type support leading back up and around one of the knobs. The lid catch needed to be "pushed" down so the washer thinks the lid is closed- well a paint brush handle did the trick there. This washer is still going strong, getting clothes just as clean as before...if I knew where to send a picture of it I would as a testament of a well built machine. To look at it you wouldn't think it could possibly still wash..but it does and wonderfully. They don't make them like this anymore! My Norge Washer is going out...the cold water wont dispense anymore and makes a very high pitched noise when trying to fill...Its fine on Hot/Warm setting but I cant wash all my clothes that way...its starting to rust as well in the barrel and looking to buy a new Maytag top loader...any one know the dimensions on this Norge so I can compare it with the Maytag Bravos? All my Norge says is 20lb capacity but Maytag goes by cu ft and says 5.0? does anyone know where to find the model number on the signature 2000 washer? I have owned my Norge 2000 heavy duty washer and dryer for 20 years. I was looking for new stackable machines but I can't find anything comparable. In fact, it's hard to find any comparable washer/dryers with infinite settings and large capacity. What they classify as jumbo these days is so much smaller than the capacity of these appliances. Since they have worked so well for me, I've suspended my search until one of them breaks down. I can't imagine when that will ever happen. I think I'll be in the rest home before these appliances quit. The only repair I needed was when the dryer belt wore down. Unfortunately the big bellied repairman was too lazy to lean the machine on a dolly while he did the repair. He laid his full 300+ weight on the dryer drum crushing it onto the foot bolts. This dented the drum in 2 places so it is off-kilter and it takes a few seconds for it to start spinning but it still works great. My washer went out about a month ago and was planning on buying a brand new front loading model. My internet clutches wouldn't let me resist a few quick searches on Craigslist. 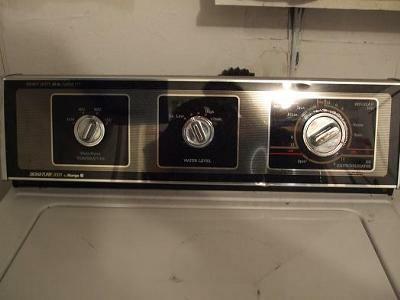 I came across a "Kenmore" set for $100 that was very close to my house and claimed to be in perfect working order. After showing up, I discovered the washer was not a Kenmore, but was a Signature 2000 made for Montgomery Wards. I was hesitant since I knew absolutely nothing of the brand. But i decided for $100 it was well worth a shot. This may sound a bit crazy - but I absolutely love this machine. It is extremely heavy duty and washes perfect every time! For someone that usually has the latest gadget, buying a vintage piece of equipment was a bit of a stretch for me - but very, very glad I did! or Montgomery Ward Signature 2000 washing machine. Cant find one anywhere.... any suggestions? I had a Norge several years ago.It was a heavy duty one. I know there are good and bad ones in every brand. It always did a great job of cleaning the Clothes. I had the extended 5 year warrenty on it. It lasted about 6 years and the Transmission went out on it. Needless to say, we had to replace it. I think its like a friend told me, if any appliance will last for 5 years, its then on borrowed time. All in all I can`t complain about it. It was a great Machine. My mother's first and third washing machines were Norge. The one my mother currently owns says Magic Chef but has the Norge agitator in it and is still working today. Her previous Norge was called Norge VHQ which stood for Very High Quality, then made by Borg-Warner. It lasted more than 20 years. I was a very good brand. Happy washing.